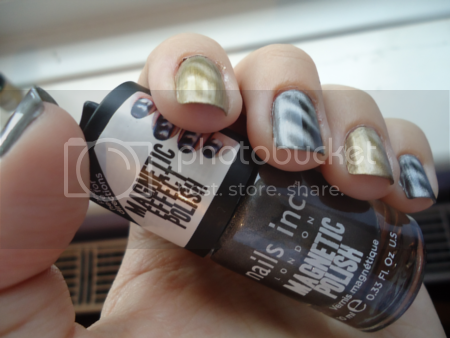 I gave in and bought the Nails Inc magnetic polishes the other day. 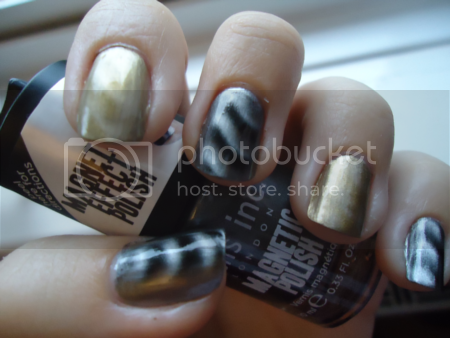 For those who don't know what a magnetic nail polish is, it doesn't mean - as most people I've mentioned it to seem to think - that you suddenly become like Magneto from X-Men and metal things stick to you (trying to set the dinner table would be a lot more interesting if it did!). 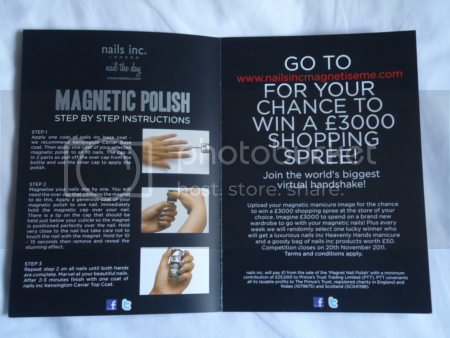 Rather, it means that the polish formula has little metal particles in it - to quote the Nails Inc website: "As the magnet is held over the nail, the iron powder in the formulation gravitates toward the magnet forming the pattern/design secretly hidden in the magnet for an astonishing finish!" 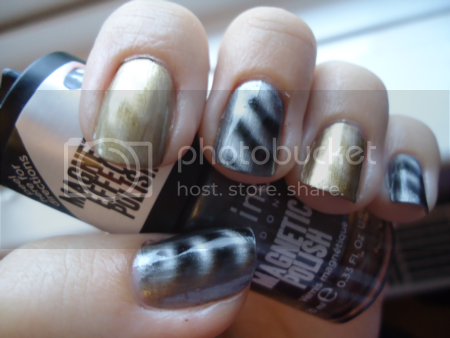 Nails Inc currently has three magnetic polishes, all named after famous London landmarks: Trafalgar Square (silver), Houses of Parliament (purple) and Big Ben (gold). I bought Trafalgar Square and Big Ben. Each comes with a magnet built into the removable cap, which then leaves a smaller bottle lid underneath. There's a little peelable instruction book on the magnet cap, but they also provide you with a larger one (with pictures) if, like my mother, you're old long-sighted. I was too impatient to try one polish at a time so I decided to alternate the colours on each nail. The instructions said to do one "generous" coat on each nail but I ended up doing two coats to make it look more even, obviously not using the magnet on the first coat. I was worried using the magnet would be awkward, but actually it was very easy. One by one I painted the second coat onto the nail and then, while the polish was still wet, held the magnet over it. You can see in the first photo above that there's a sticky-up bit (the technical term!) on the cap that you're supposed to hold over the cuticle to make it easier to position the magnet. I actually ended up resting it lightly on my cuticle as it made it easier to hold the magnet steady over my nail without touching the polish. I one-Mississippi-two-Mississippi'd for about fifteen seconds before lifting the magnet away to reveal the cool effect. Considering it was my first go, I'm really pleased with how this turned out. The formula on these was brilliant, I had no problems whatsoever. My application wasn't perfect as I was so worried about the polish drying before I had a chance to use the magnet that I wasn't as careful as I should have been. My only real complaint is that it's quite hard to see the pattern with Big Ben (the gold polish); it's nothing like as obvious as Trafalgar Square. In some lights it's almost invisible, which is a pity. 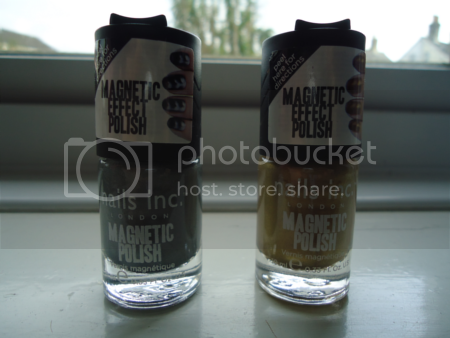 Nails Inc magnetic polishes are priced at £13 on their website (or £11.70 with their reward scheme) with £1 going towards The Prince's Trust. I'll freely admit they're not cheap. 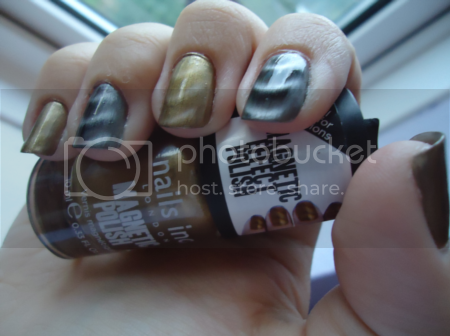 However, for such a beautiful effect - and such an easy alternative to nail art - I think they're worth every penny.